It’s tempting to think of a merger simplistically; as a power move that will double your capacity and cut costs. But the pressure accountants might be feeling right now isn’t necessarily from lack of resources or scale. And pursuing a merger merely to fill some empty office space, spread costs or utilise excess staff aren’t good enough reasons to proceed with a merger. If merging your practice with another isn’t necessarily a silver bullet, then what is there to do? Is my practice prepared technologically? Even the casual observer will notice that tech has made basic accounts preparation and bookkeeping much easier for your clients. As bean counters are automated, have you taken the steps necessary to rebrand and reposition your practice? As Annie Makoff put it in the ICAEW’s magazine Economia: "Accountants will need to become consultants able to interpret business symptoms and prescribe appropriate action”. Do you have the technology necessary to utilise these skills? But tech isn’t just about continuously adding more complexity to your practice. With the advent of accounting platforms, practitioners now have the ability to ‘merge’, if you will, their different operations into one seamless whole. Is my firm prepared for altered client expectations? As Paul Shrimpling of the Remarkable Practice: “Only your clients can determine whether they receive value for money or not”. In the years since Shrimpling wrote this, that pressure has only increased. Business owners have a much stronger image of how things ought to be. Can you match this image? Do you have the data required to offer a flexible, tailored, and insightful service offering? Do you offer modern services like online meetings? After completing the requisite soul searching, you might decide you’d still like to complete a merger. 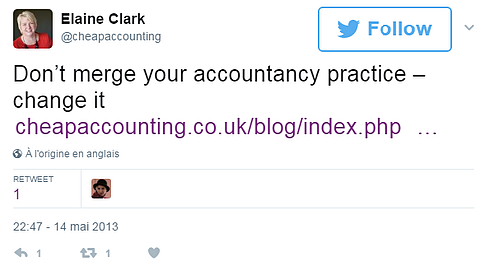 That’s not unreasonable, of course: the accounting profession in the UK has a long history of mergers. But now, more than ever, it’s important that any potential merger builds towards the broader trend of digital disruption within accounting. Once you’ve built a connected accounting practice, at the tippy-top of your accounting firm merger checklist should be cultural fit. Simon Haynes, managing partner of Colin F. Whitfield & co., summed this idea up well after his firm merged with a competitor last year. “We have been looking for a practice with similar values to provide the services and same level of service clients of Colin F Whitfield & Co have come to expect from us over the years,”Haynes told Accountancy Age. In Haynes words there lies a golden truth: even if you’re an exceptional firm, if you combine an average practice it’s not going to work out. The accounting merger specialist Russell Shapiro perhaps put it best: “The most important factor is that the merging firms be culturally compatible. When you look for your potential partner, make sure they are just as ready for accounting’s future as you are. Anything less is a step down.